2012 - after viewing a great promo site for "Simple Song" by The Shins I decided I wanted to try the same, but with one key difference - No Flash. Yes the site is primarily HTML and CSS but the core audio mechanism is based in Flash (for the real-time audio processing I'm guessing). I wanted to find out if it was possible to use HTML5 audio in place of Flash while still retaining the core functionality. The next step was to make the reel to reel machine actually work. 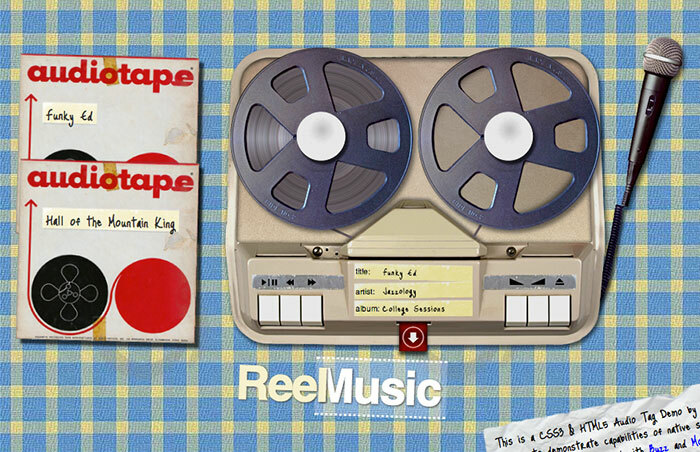 The trickiest part of this was the illusion that tape is moving between the two reels, especially working out how the tape angle changes with the amount left on the reel as the song progresses. The end result is hopefully a fun new take on some old skool' technology. Best viewed in webkit browsers but others supported (not tested in Internet Explorer but I suspect probably 10+ to be in with a chance).